Uninvited Guest is a 500-piece jigsaw is designed by Mary Thompson. A diverse collection of colorful birds flock around a bird feeder on a snowy day. Available in two piece counts. 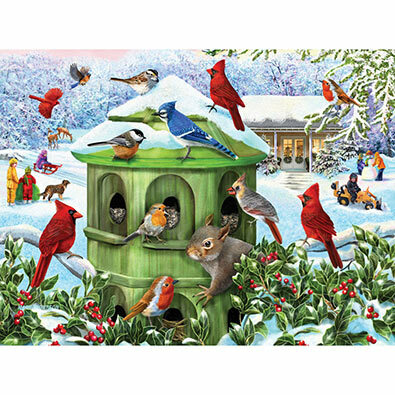 This 500-piece jigsaw puzzle is designed by Mary Thompson and measures 18" x 24". Several animals gather around a snowman a distance away from town. Available in two piece counts. This 500-piece jigsaw puzzle is designed by Mary Thompson and measures 18" x 24 This puzzle depicts a snow-covered farm on a bright winter day. Several animals have gathers together to play in the snow. Available in two piece counts. This 500-piece jigsaw puzzle is designed by Mary Thompson and measures 18" x 24". Various animals have come together on this snowy day to play together. People have gathered at a frozen lake to try their hand as skating. Available in two piece counts. Each 500 piece jigsaw is designed by Mary Thompson and measures 18" x 24". Available in two piece count.